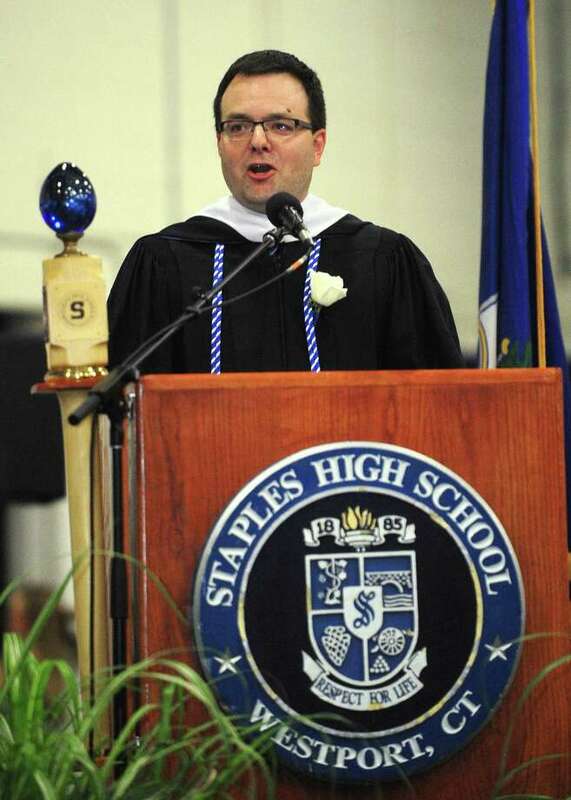 Principal James D'Amico address the crowd during the Staples High School Class of 2017 graduation Thursday June 22, 2017, at the school in Westport, Conn.
WESTPORT — The search for a new Staples High School principal is on, and will include input from staff and the community. This follows a turbulent month for Westport Public Schools that saw the resignation of both the superintendent and high school principal. In an email to parents Friday, Acting Superintendent of Schools Anthony Buono said the district hired JE Consulting to conduct the search to replace current Staples Principal James D’Amico, who announced in March he plans to leave at the end of the year for a job as principal at New Fairfield High School — his alma mater. “The position will be posted this week. Concurrently, we will organize focus groups for staff members, parents, and students to discuss and identify the important characteristics of an exceptional high school principal,” Buono wrote. Once an ideal candidate profile is developed, a “school-based” committee will review applications and interview candidates at the beginning of June. The Board of Education will then conduct interview with finalists and appoint a new principal by the end of June “if all goes well,” Buono wrote. The search for a new principal signals a move forward after a difficult year in Westport schools, as the district grappled with the sudden closure of Coleytown Middle School in September due to mold issues. The past moth was especially tumultuous and began with the resignation of D’Amico on March 8, followed a week later by the announcement Superintendent Colleen Palmer would be leaving the district. In light of these events, parent and school advocate Robert Harrington said the opportunities for community involvement are necessary in the search for a new Staples principal.